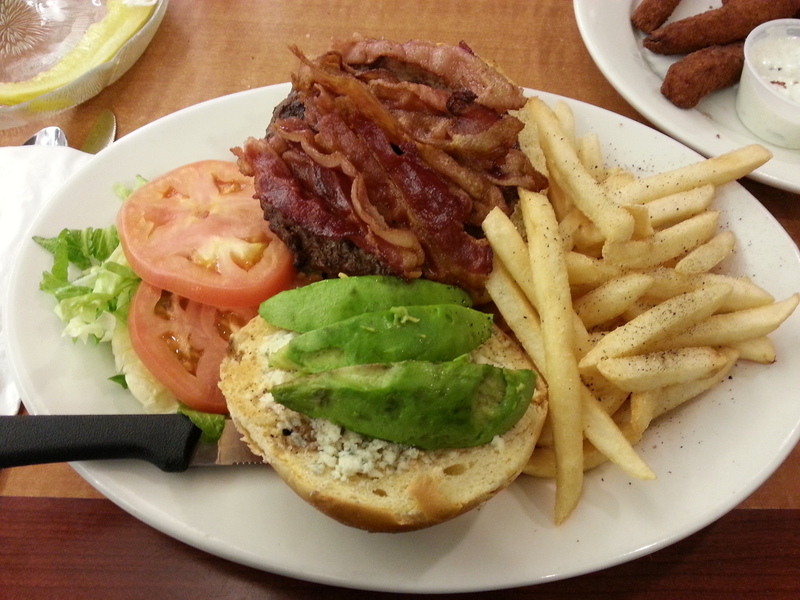 My burger with bleu cheese, bacon, and avocado. My friend Dave Zohn had been raving about the Nutley Diner for years. It is such a part of his life that I let him name the title of this restaurant review. We went to see Star Wars: The Force Awakens earlier this year, so this become the opportunity for me to finally eat at this place. When we arrived I was blown away by the chrome. It was everywhere. The whole diner seemed encased. But it did not look old-school chrome, like a place that had seen better days— this was beautiful and polished. The diner felt clean and was really nice on the inside. When you first walk in, there is a display case filled with better looking desserts than normal, with a bar right above that displaying all their liquor. Damn. That’s all you need right there. Due to a long drive ahead of me, I did not imbibe in any alcoholic beverages, though a beer would have went pretty darn good with the burger I ordered. 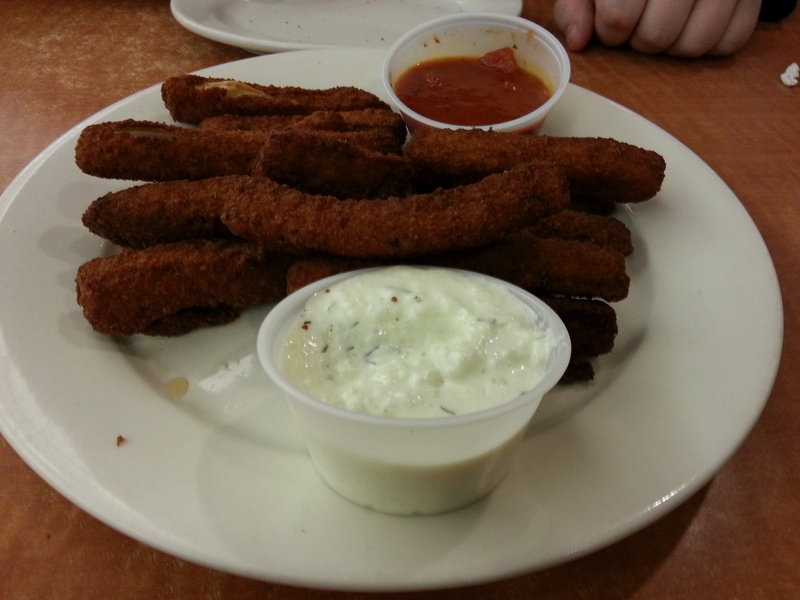 We started out with a plate of fried zucchini sticks. It came served with a cup of marinara sauce as well as a type of Greek tzatziki. This, I wish we passed on. They weren’t burnt but were so darkened and hard that we could have had a sword fight with them out in the parking lot and they wouldn’t have broken. There was barely any zucchini at all in the coating, and it could have used some salt. Maybe next time we try the spinach and artichoke dip, or scratch that and swap in a dessert such as the Oreo cheesecake which nearly put me in coma just by looking at it. Thankfully, the experience was saved by the avocado, bacon, and bleu cheese burger I had. This came within approximately two minutes of receiving the appetizer—they didn’t even have a chance to get cold and harden further. Taking a chance, I ordered it medium and they cooked it just fine. The burger itself was well-seasoned, and the creaminess of the avocado did wonders to match the bite of the cheese which was on both the top and bottom bun. And as for the bacon, well, that goes good on anything. The side of fries with it was decent, but I feel compelled to say that their “deluxe” does not include onion rings like seemingly any other diner, even the worst. To deluxe your burger simply means adding fries, lettuce, and tomato—items that normally come on the side anyway. My friend had a corned beef reuben which looked great. I would actually order that next time, if there is a next time. I would like to try this place again. Not because I was dissatisfied, but because their menu was gigantic (it seemed larger than your typical Jersey diner menu) and I want to explore more. Being a suburb of Newark and in the middle of so much hustle and bustle they are open 24 hours. Once again, I must note their redeeming quality is the atmosphere and cleanliness. The service was nice, if not a bit spotty. 3.5 out of 5 stars. This review was previously posted here. The Nutley Diner is located at 372 Centre Street in Nutley, New Jersey.